Uganda, officially the Republic of Uganda, is a landlocked country in East Africa and is the world's second most populous landlocked country after Ethiopia. The southern part of the country includes a substantial portion of Lake Victoria, shared with Kenya and Tanzania. Uganda is in the African Great Lakes region. Stamps were issued by the Uganda Protectorate in 1895. Uganda then used stamps of East Africa & Uganda (1903-1922), Kenya & Uganda (1922-1927) and Kenya, Uganda and Tanganyika/Tanzania (1935-1976). 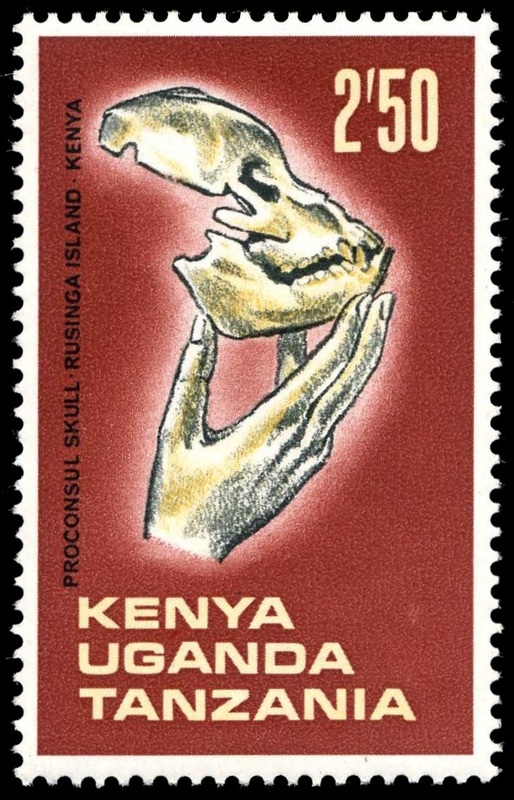 Although Uganda had its own postal administration from 1962, commemoratives inscribed Kenya, Uganda and Tanzania remained in use until 1976. The first stamps of independent Uganda were issued on 9 October 1962. 2012-2014 several hunderds colorful stamps produced by Stamperija on behalf of Uganda. 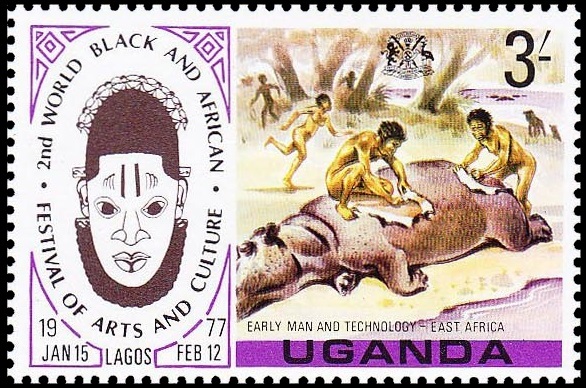 15.01.1977 "World Black and African Festival of Art and Culture "  08.04.1992 "Dinosaurs" 15.07.1995 "Dinosaurs"
 Stamp with face value of 2.50 Sh. shows hand holding Proconsul skull. 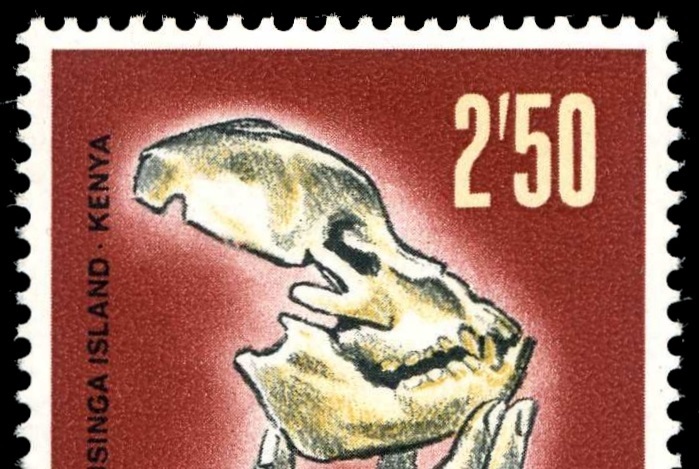 Proconsul is an extinct genus of primates that existed from 23 to 25 million years ago during the Miocene epoch. Fossil remains are present in Eastern Africa including Kenya and Uganda. Four species have been classified to date: P. africanus, Proconsul gitongai , Proconsul major and Proconsul meswae. The four species differ mainly in body size. Environmental reconstructions for the Early Miocene Proconsul sites are still tentative and range from forested environments to more open, arid grasslands. The first specimen, a partial jaw discovered in 1909 by a gold prospector at Koru, near Kisumu in western Kenya, was also the oldest fossil hominoid known until recently, and the first fossil mammal ever found in sub-Saharan Africa. The stamps issued in mini-sheet and separate sheets format. 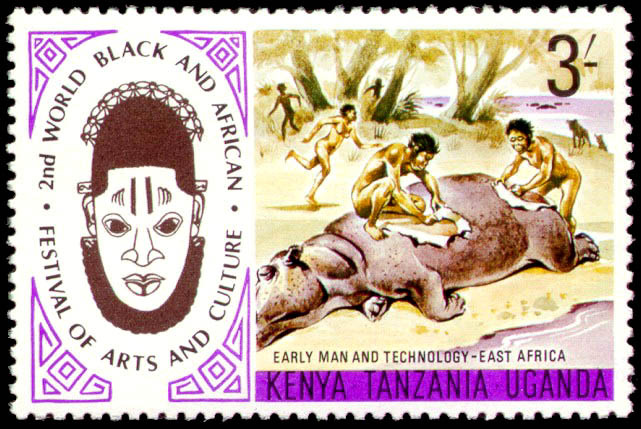 Similar stamps issued by Kenya and Tanzania. Charles Darwin depicted on one of the stamps in the second row of the sheet.